TrueCar is predicting that for 2015, new car sales in the United States will reach a decade-high of 17 million units and set an all-time record of $553 billion in revenue. How realistic is that? TrueCar is not new to making predictions and most of the time, those predictions are based on a good taking of the automotive industry's pulse. This time around, the car buyers and sellers platform is expecting the 2015 U.S. market to reach decade-long highs. 2005 was a good year for the new car sales market. It was one of several years of boon for the industry, before the financial ruin that came in 2008 with the restructuring and bailouts that took hold of the U.S. automotive industry shortly thereafter. For most of the past decade, new car sales have been below those 2007 and earlier levels. Now, says TrueCar, that's no longer the case. Given the slow return of the new car market, it's not difficult to predict that a comeback is in the offing. Predicting it for 2015 could be seen as a stretch, but with current sales levels nearing (and sometimes exceeding) 2008 levels, especially for Japanese makes, it's clear that a comeback is coming. 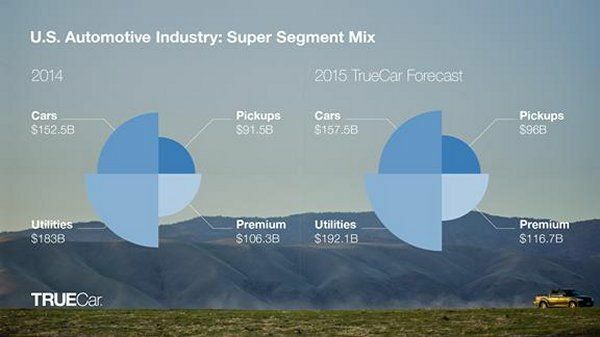 TrueCar predicts that 2015 will see a total gain of about 2.6 percent in new car and truck sales, pushing to 17 million units for the year. “We see a convergence of favorable economic circumstances pushing auto demand up to pre-recession levels, including continued gains in the job market, the best consumer sentiment in eight years and low fuel prices,” said John Krafcik, president of TrueCar. The company then goes on to predict revenues from those sales reaching an all-time high of $553 billion, which would be a five percent increase over 2014 expectations. For reference, that $553B would mean about $1.2 trillion in total revenue for the industry in the U.S. Most of this increase will likely be due to a decrease in the number of heavy-handed incentives being offered by automakers to entice buyers into the showroom. Growth will be lead by luxury automotive sales, says TrueCar, continuing the trend from this year, with the segment gaining 9.8 percent in 2015 ($116.7B). Non-luxury vehicles will see 5 percent gains ($192.1B) and pickup trucks a 4.5 percent gain ($95.7B). Some of the gains in some segments will be at the expense of others, namely mass-market cars as consumers continue the trend of moving towards luxury autos and crossovers. To give readers a gauge of TrueCar's prediction accuracy, for 2012, the company predicted new car sales in the U.S. would be at about 14.3 million units. The market itself posted about 14.5 million units for the year.